We did end up with one day of particularly cold and windy weather. Brent spent the morning in LA doing a little work. His dad tagged along. That left us girls to explore. 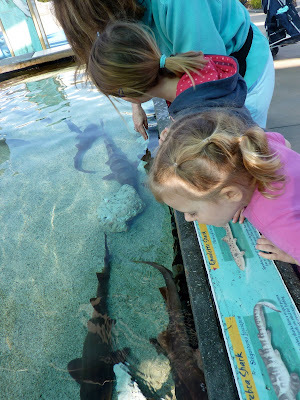 The beach was not inviting and so we headed North to the Long Beach Aquarium. This was a wonderful aquarium. 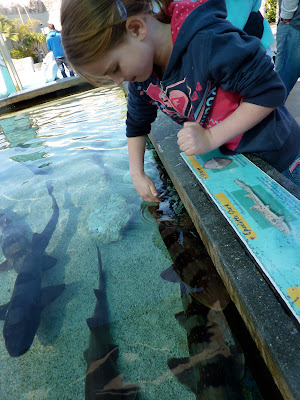 The children could "pet" the sharks... Ellery was the only one who dared to even come close. 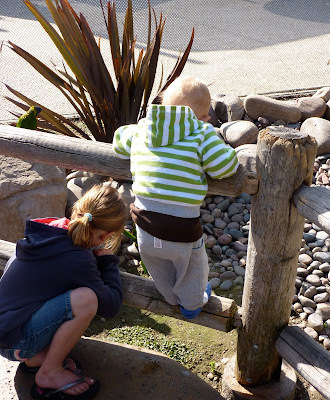 Callista put on a brave face, but wouldn't get her little fingers anywhere near the water. The texture and feel brought me back to Zoology 300 something, a dissection class in college. We did a shark, about this size. These smelled much better though. The ray was a little less intimidating for Callista. Emmett acted brave, but when I tried to dip his hands in for a little touch, he shrieked in terror. Ellery especially enjoyed the Lorikeet habitat. If only we had spent $3 on an ounce of nectar they would have landed on the children. How many ways can they think of to squeeze money out of our pockets? How did I get my camera to do this? No matter how many times I read the directions, whenever I try to take a picture of my children with an out-of-focus background, it doesn't work. But of course, it works on the mini-parrot. 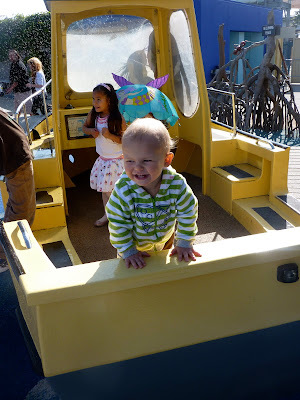 Emmett blissfully romped in this "cahr." I'm not sure when he will start to distinguish moving objects with motors as anything beyond cars. We are waiting on pins and needles. Mimi relished a rare moment when Emmett actually allowed her to touch him! Here they are attentively watching the seals and otters before the show and feeding. I have to admit, the entire show I worried a trainer would be grabbed and pulled under. These animals were huge. 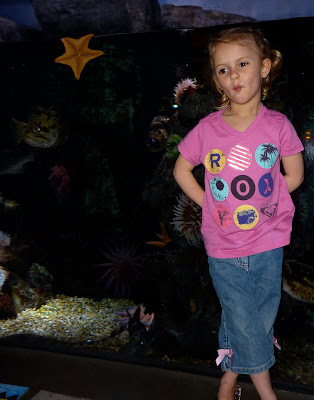 Who knew they had fish parades at the aquarium? And yes, there you have it, a picture of me and my ever thickening belly. Take note of the "Fish Story" poster in the background. What I thought would be a harmless, entertaining, biological life cycle story, in animated 3D, turned out to be propaganda at its best. Don't misunderstand. I am a firm defender of the environment. My science background gives me a more in-depth understanding of the complexity of nature and ecosystems than the average American. But this 15 minute film did nothing but decry evil humans and all they do. If only we could rid the planet of humans, the animals could survive and thrive in bliss. Population reductionism at its finest. I'm sorry, but I believe we all can exist in harmony. Clearly many of the current practices of humans are inhumane and destructive and inexcusable. But, humans themselves are not the problem. The actions and practices of select individuals and societies are. But the message of this movie was political, emotional, and psycologically seductive for young children. I had to do some reteaching afterwards. It was unfortunate this was my last taste of the aquarium. Overall it was a wonderful educational experience for the children. Sometimes, we can also use negative examples as teaching tools as well. Hopefully I was able to do so in this particular circumstance. How fun, I love all the pictures and the parade...looks great! That stinks about the movie, but what movie doesn't have a hidden agenda right? Your kids are so darn cute and oh my gosh, I don't think I see a belly! Looks like you are still fitting into your regular jeans which is awesome!